Kim Sŏng-ae (Chosŏn'gŭl: 김성애, 29 December 1924 – September 2014) was a North Korean politician who served as the First Lady of North Korea from 1963 to 1974. She was the third wife of the President of North Korea, Kim Il-sung. Kim Song-ae originally worked as a secretary. She married Kim Il-sung in 1952, following the death of Kim Il-sung's second wife in 1949, although due to the Korean War no formal ceremony was held. One source indicates Kim Il-sung had had an affair with her even before his first wife died. She gave birth to a daughter (Kim Kyong-jin, 1953) and two sons (Kim Pyong-il, 1955; Kim Yong-il, 1957). She later rose in political power. From the mid 1960s until the mid 1970s, Kim Song-ae allegedly held a significant amount of political influence in North Korea. As her tenure of political significance occurred in about the same period as that of Jiang Qing in China during the culture revolution, Jang Jin-sung referred to Kim Song-ae as the "North Korean mirror image of Jiang Qing". 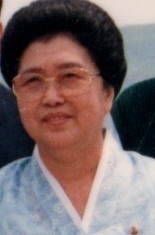 In 1965, she became vice-chairwoman of the Central Committee of the Korean Democratic Women's League (KDWL), and in 1971, she rose to be chairwoman. In December 1972, she became a representative of the People’s Supreme Assembly. According to Jang Jin-sung, Kim Song-ae had the ambition to place her son, Kim Pyong-il in the position of successor to her spouse Kim Il-sung, rather than his son from his first marriage, Kim Jong-il. In this, she was supposedly supported by a faction of the North Korean political elite, among them her brother Kim Kwang-hop, and Kim Il-sung's brother Kim Yong-ju, and opposed by the faction of her stepson Kim Jong-il. In the 1970s, her influence was reportedly seen as excessive by the party, who started to curb it. In parallel, her stepson Kim Jong-il became the designated heir of Kim Il-sung, and his faction worked to remove her from influence. In 1976, Kim Song-ae lost her position as chair of the KDWL, which removed her communication channel to the public and effectively curbed her power base. Reportedly, Kim Song-ae, as well as her brother-in-law Kim Yong-ju, who had supported her plans to place her son in the position of heir instead of Kim Jong-il, was placed in house arrest in 1981 upon the wish of the designated heir Kim Jong-il. In 1993, she was reinstated by Kim Jong-il as chair of the KDWL, but her position was purely symbolic and nominal, and she was removed a second time in 1998. Since 1998, little information about her has reached the outside world. In 2012, a report from a North Korean defector claimed that Kim Song-ae had been declared insane in the early 1990s, even before the death of Kim Il-sung, and since then been kept under supervision of a psychiatric nurse in her house arrest. There are rumours that she was killed in a car accident in Beijing in June 2001. Other reports claimed she was still alive as of July 2011, though in poor health, and that Kim Pyong-il returned to Pyongyang from his posting in Poland to visit her. She was later reported to have died in 2014, a date which was confirmed by the Ministry of Unification in December 2018. Kim Song-ae (1969). Let Us Women Become Revolutionary Fighters Infinitely Loyal to the Party and Reliable Builders of Socialism and Communism by Revolutionizing and Working-classizing Ourselves. Pyongyang: Foreign Languages Publishing House. OCLC 253679297. — (1970). On the Women's Emancipation Movement in Korea. Report at the Meeting Held in Honour of the 25th Anniversary of the Founding of the Korean Democratic Women's Union, November 17, 1970. Pyongyang: Foreign Languages Publishing House. OCLC 1012367. ^ a b Lee Su-gyeong (이수경) (2 May 2006). "김부자 실체: 김정일의 계모 김성애". Radio Free Asia (Korean service). Archived from the original on 27 June 2007. Retrieved 20 May 2007.